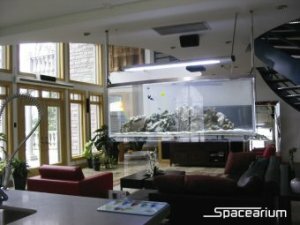 Introducing the SPACEARIUM, a new and unique way to reinvent your indoor space. This design concept, with its streamlined aesthetic appeal and innovative technology, makes an outstanding design statement in any interior setting. We build these custom for each installation. No bulky furniture is required to support the Spacearium. You can create a relaxing atmosphere right in the middle of your living space without cluttering the space or blocking th e light. In commercial application your valuable floor space is saved for such things as product display or customer seating. 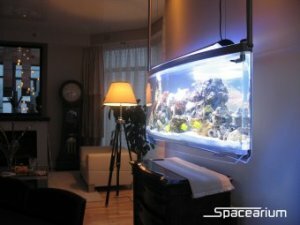 With its unique elliptical shape, the Spacearium eliminates the awkward edges and angles associated with conventional aquariums. 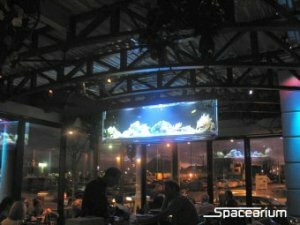 From wherever you stand in the room you can enjoy the marine life and beautiful seascape. Using premium quality lightweight acrylic, the Spacearium has no opaque reinforcements at the extremities. 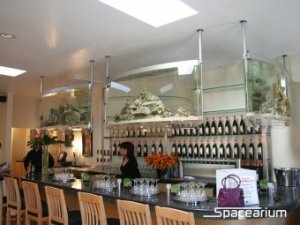 Combined with the sophisticated remote filtration, the marine life seems to be in its natural environment. This gives you a living picture that keeps renewing itself right in front of your eyes. An elaborate filtration system especially developed for the Spacearium is remote mounted to hide the unaesthetic apparatus from view and provide powerful filtration keeping all the inhabitants healthy and happy. 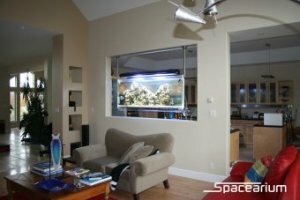 The Spacearium is connected to your ceiling structure through a mounting rail using the appropriate attachments for your type of construction. Water is sent back and forth to the filter though hoses which are hidden in the stainless steel tubes.